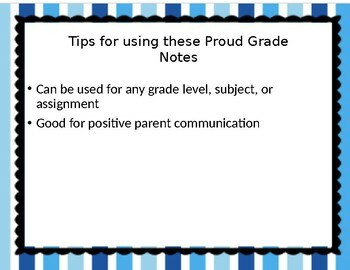 These Proud Grade Notes are the perfect item to increase your positive parent communication for your students for any grade level, subject or assignment. 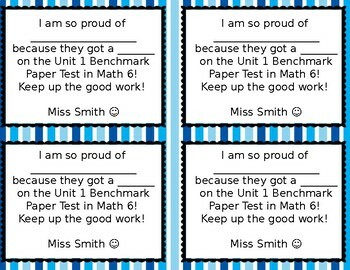 These notes can be printed on paper and sent home with individual students or can be used to send to parents virtually. 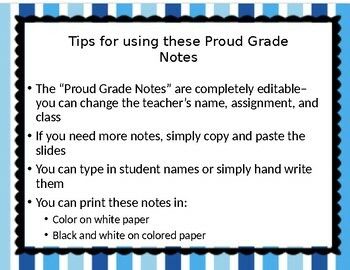 The “Proud Grade Notes” are completely editable– you can change the teacher’s name, assignment, and class. If you need more notes, simply copy and paste the slides. You can type in student names or simply hand write them. 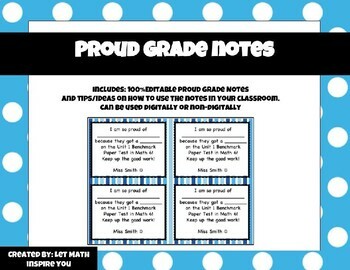 You can print these notes in color on white paper, black and white on colored paper, or email home a virtual copy.